Serobid (Salmeterol Xinafoate Inhaler) is used for the treatment of asthma (which includes patients with nocturnal asthma and exercise-induced asthma) only as concomitant therapy with an inhaled corticosteroid. Serobid inhaler, a generic version of Salmeterol is manufactured by Cipla Limited, India in the strengths of 25 mcg. 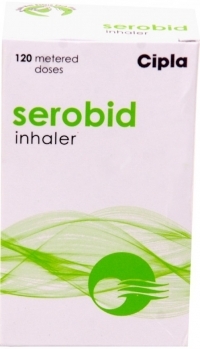 Serobid inhaler is priced at only $8.50 per inhaler. We also have in stock Seroflo Rotacaps (Salmeterol and Fluticasone Propionate powder for inhalation) containing a corticosteroid and a long-acting beta2-adrenergic agonist which are used for the maintenance treatment of asthma as well as maintenance treatment of airflow obstruction and reducing exacerbations in patients with chronic obstructive pulmonary disease (COPD). 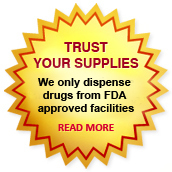 We supply original Serobid Inhaler manufactured by Cipla Ltd., India. Each canister contains 120 metered doses. The active ingredient present in Serobid inhaler is Salmeterol Xinafoate. Each actuation delivers 25 mcg of Salmeterol (as Salmeterol Xinafoate IP). Each canister contains 120 metered doses. 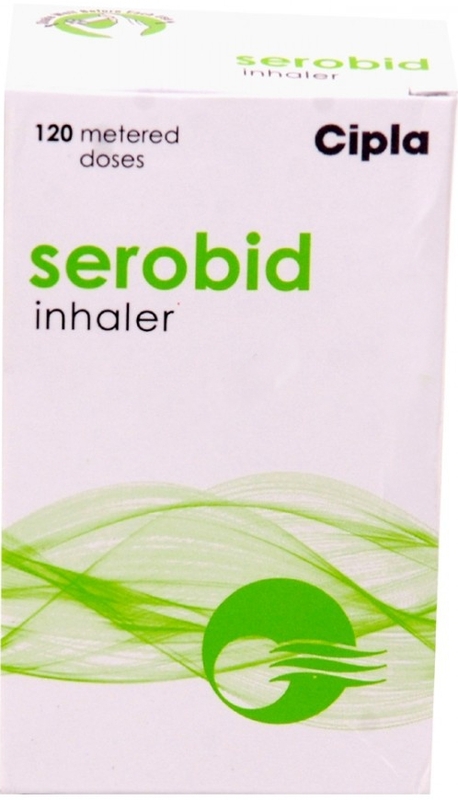 Serobid Inhaler (Salmeterol Generic) is used for the treatment of asthma and prevention of exercise-induced bronchospasm (EIB) in patients aged 4 years and older. This medicine is also used for the maintenance treatment of bronchospasm associated with chronic obstructive pulmonary disease (COPD). The usual dose is two inhalations of 25 mcg twice daily. For More Severe Airways Obstruc­tion the dose is four inhalations of 25 mcg twice daily. The usual dose is two inhalations of 25 mcg twice daily. Store Serobid (Salmeterol Xinafoate Inhaler) at controlled room temperature 25°C and below. Protect from direct sunlight. Serobid Inhaler should not be exposed to extremes of temperature and protected from humidity. Serobid Inhaler is contraindicated in patients with a hypersensitivity to Salmeterol Xinafoate or any inactive ingredient present in Serobid Inhaler. Long-acting beta2-adrenergic agonists, such as Salmeterol Xinafoate, the active ingredient present in Serobid Inhaler, could increase the risk of asthma-related death. Therefore, when treating patients with asthma, Serobid Inhaler must only be used as additional therapy for patients not adequately controlled on other asthma-controller medications (e.g., low- to medium-dose inhaled corticosteroids) or whose disease severity clearly requires 2 maintenance therapies, including Serobid Inhaler. Once asthma control is achieved and maintained, assess the patient at regular intervals and step down therapy. The lowest effective dose of Serobid Inhaler must be used. Do not use Serobid Inhaler for patients whose asthma is sufficiently controlled on low- or medium-dose inhaled corticosteroids. Treatment with Generic Salmeterol inhaler must not be started in patients with significantly worsening or acutely deteriorating asthma, which may be a life-threatening condition. Serobid Inhaler should not be used to treat acute asthma symptoms for which a fast and short-acting inhaled bronchodilator is required. Serobid Inhaler should not be used in conjunction with an inhaled, long-acting beta2-agonist. Generic Salmeterol inhaler should not be used as the first treatment for asthma and is not a substitute for oral or inhaled corticosteroids. Serious asthma-related adverse events and exacerbations may occur during treatment with Generic Salmeterol inhaler. Patients must be asked to continue treatment but to seek medical advice if asthma symptoms remain uncontrolled or worsen after starting therapy with Generic Salmeterol inhaler. Potentially serious hypokalaemia may result from ß2 agonist therapy. Particular caution is advised in acute severe asthma as this effect may be potentiated by hypoxia and by concomitant treatment with xanthine derivatives, steroids and diuretics. Serum potassium levels should be monitored in such situations. Immediate hypersensitivity reactions may occur after administration of Generic Salmeterol inhaler, as demonstrated by cases of urticaria, angioedema, rash, and bronchospasm. Symptoms of laryngeal spasm, irritation, or swelling, such as stridor and choking, have been reported in patients receiving Serobid Inhaler. Serobid Inhaler like all sympathomimetic amines, should be used with caution in patients with cardiovascular disorders, especially coronary insufficiency, cardiac arrhythmias, and hypertension. Serobid Inhaler, like all other beta-adrenergic agonists, can produce a clinically significant cardiovascular effect in some patients as measured by pulse rate, blood pressure, and/or symptoms. Although such effects are uncommon after administration of Generic Salmeterol inhaler at recommended doses, in case they occur, the medicine may need to be discontinued. In addition, beta-agonists have been reported to produce ECG changes, such as flattening of the T wave, prolongation of the QTc interval, and ST segment depression. Anaphylactic reactions including oedema and angioedema, bronchospasm and anaphylactic shock. The pharmacological side-effects of beta-2 agonist treatment, such as tremor and headache have been reported, but tend to be transient and to reduce with regular therapy. Tremor occurs more commonly when administered at doses higher than 50 micrograms twice daily. Tachycardia occurs more commonly when administered at doses higher than 50 micrograms twice daily. Very rare: Cardiac arrhythmias including atrial fibrillation, supraventricular tachycardia and extrasystoles. Oropharyngeal irritation and paradoxical bronchospasm. Get emergency medical assistance if you have any of these signs of an allergic reaction to Serevent: hives; difficult breathing; swelling of your face, lips, tongue, or throat. The expected signs and symptoms with overdosage of Salmeterol are those of excessive beta-adrenergic stimulation and/or occurrence or exaggeration of any of the signs and symptoms listed under side effects eg tremor, headache, tachycardia, dizziness, increase in systolic blood pressure etc. In case overdose occurs, the patient should be treated supportively with appropriate monitoring as necessary. The preferred antidotes are cardioselective beta-blocking agents, which should be used with caution in patients with a history of bronchospasm. Additionally, hypokalaemia can occur and, therefore, serum potassium levels should be monitored. Potassium replacement should be considered. Salmeterol Xinafoate Inhaler (Serobid ) has been classified by the US FDA as Pregnancy Category C. There are insufficient data on the use of Salmeterol during pregnancy in women to assess the possible harmful effects. During animal studies, foetal abnormalities have been seen to occur after administration of beta2-adrenoreceptor agonists. Use of Serobid Inhaler during pregnancy should only be considered only if the expected benefit to the expectant mother is greater than any possible risk to the foetus. It is unknown whether Salmeterol is excreted in human breast milk. During animal studies in rats excretion of Salmeterol in breast milk has been observed. A decision on whether to continue/discontinue breast-feeding or to continue/discontinue therapy with should be made taking into account the benefit of breastfeeding to the infant and the benefit of Salmeterol Generic therapy to the nursing woman. You can buy Generic Salmeterol Xinafoate Inhaler online from Clear Sky Pharmacy at a cheap price of only $8.50 per inhaler. Serobid Inhaler 25 mcg, manufactured by Cipla Ltd., India is supplied in a canister containing 120 metered doses. Each actuation delivers 25 mcg of Salmeterol. The 25 mcg Serobid Inhaler (Salmeterol Generic) costs only $8.50 per unit when you place an order for 20 canisters.